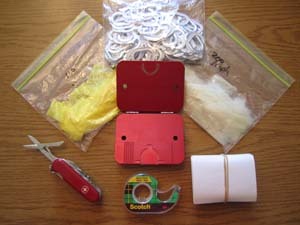 All the items you will need to make your own turkey mouth call. A mouth call is a fairly simplistic call, as far as construction is concerned. The science is found in both the stretch and cuts of the reeds. The stretch and cuts in the reeds are what create the tonal qualities of the call, and what differentiate one from the other. 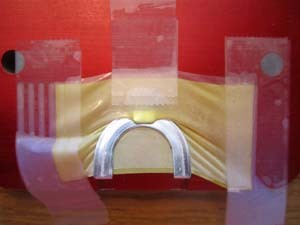 A mouth call is made up of three parts; the reeds, the frame, and the tape. They are put together in a way that allows the call to be used like a musical instrument. Pressure is put on the reeds with the tongue, and when air is blown across them, a note comes out. The high or low sound of the note depends on many different things, but within each style call, it is the pressure put on the reeds by the tongue in conjunction with the amount of air being pushed through the call. The higher the pressure, the higher the note, and vice versa with low pressure. To describe how a mouth call is made, I will walk you through the step by step process of making one. First, you need to have the necessary equipment. You will need latex or prophylactic reeds, aluminum frames, mouth call tape, scotch tape, a small very sharp pair of scissors, and a jig to make the call on. With all this handy, we can start from the beginning. First choose the reed type and thickness for the call you want to make. For this description I will choose one piece of prophylactic rubber, and one piece of .004" thick latex rubber. Obviously this is going to be a two reeded call. Reeds come in many different thicknesses from .003" to .006", and each will sound and blow different. Trying different thicknesses, and combinations thereof, will allow you to find what works best for the way you like to call. Both latex and prophylactic rubber aligned on the jig ready to be stretched to desired tension. Next, align the first reed on the jig. Remember, the first reed down will be your top reed. So, for the call I am making, I will have the .004" yellow latex reed on top. It is the thicker of the two reeds I will be using, and I like the deeper sound it makes being the top reed. The top reed produces the sound at the end of the call, so a deeper tone, for me, is more desirable. After taping down the first reed, I put the next reed, being prophylactic rubber, on top of it and spaced back slightly. The proph is much thinner and has a high pitch to it. A great choice for the beginning high pitch sounds of a hen yelp. The reeds stretched side to side and back with tension. It is now ready for the frame. Then I stretch both reeds to the side, one at a time to the desired tension. Be sure to add back tension tape so you can add back tension one both reeds are stretched. Liking more or less tension will vary from person to person pending on how they call. I like my calls to have a medium to lose tension. I feel I have more control of the sounds that way. You can always add tension with your tongue, but you can't loosen tension if it's built into the call. Once the side tension is set, pull the tape put on the reeds for back tension. move it back to the desired point and set the tape. Frame in place, stamped, and the tab is turned over to hold frame close and back tension. Now the call is ready for the frame. Take your frame and start the bend prior to setting it in place. Setting it to about a 90 deg's will make it easier to close. If your frames come with an added adhesive, be sure to remove that. I like the frames with adhesive, because I feel it gives the frame a little more hold on the reeds and keeps them in place better. Slide it under the reeds with the tab side down, and then finish bending the frame closed. Stamp the frame to set it and close it completely. This may be done in different way depending on your call making setup. 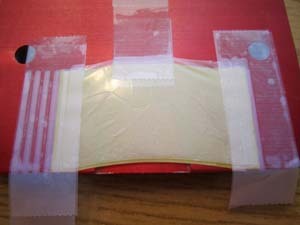 Then bend the tab up and around the back side of the call. This will not only keep the call closed in the back, but it will also keep a firm grip on the reeds, keeping the back tension exactly how you set it. Cut the excess away from the frame. Now, pull the frame out and cut off all the excess reed material. It's at this time that I like to make any cuts in the call that I plan to make. With this call, I am going to make what is commonly referred to as a Ghost Cut. 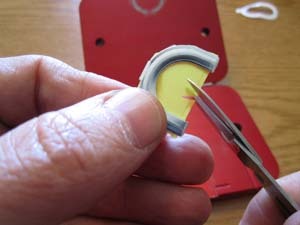 I simply cut a V shape cut in the top reed, and pull out the middle V tab. Then I cut off the sharp corners on both sides of the opening I have just created. Cut the desired cut out of the top reed. Lastly, all the call needs is some tape. 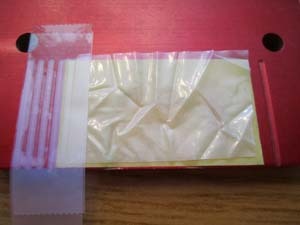 The tape, similar to a Johnson & Johnson medical tape, is already precut with a hole in the center to fit the size of the frame. Just wrap it around the call evenly, and cut off the excess to your desired size. You are now ready to try out your new call. I personally like to run the call under some tap water, reeds up, for a few seconds. This will wash away much of the powder that is found on the latex. This will allow the call to run much better. Put the tape around the frame and cut to desired size. If the call takes too much air for your liking, you may want to make your next one with a little less tension. If the call sounds sloppy with no high end, you may want to tighten it up a little. It's all trial and error. But, you don't need to move the reeds much. The slightest adjustment one way or the other can make a big difference. I hope this helped you not only understand how a mouth call is made, but how it works as well. Best of luck this season, and Hunt Hard, and Hunt Safe.